Arizona Fine Aggregate Business (AZFAB) has a staff with over 60 years of combined industry experience in the design and construction of fines recovery systems. AZFAB offices are located in Tucson, Arizona with assembly shops on site as well as in Bridgeport, Texas. In addition the company is an industry leader in custom and process design which enables AZFAB to go beyond the traditional role of manufacturer and offer innovative solutions to key industry problems. AZFAB can offer water reclamation systems that meet the ever-increasing environmental demands placed on plants in the aggregate industry. These reclamation solutions which not only conserve a shrinking resource like water, but can also do great things for your bottom line. The U.S. demand for frac sand is exploding, with no foreseeable end in sight. The International Energy Agency predicts that more than a half-million new wells will be drilled in the United States by 2035, creating the need for a steady stream of high-quality frac sand. The opportunities for producers are tremendous, and AZFAB is ready to help turn that opportunity into a reality. AZFAB has a proven process to separate, scrub and wash fracture sands that meets or exceeds API standards. We can provide precise cuts and aggressively clean your material thus providing high quality Proppant that will meet your customer’s needs. 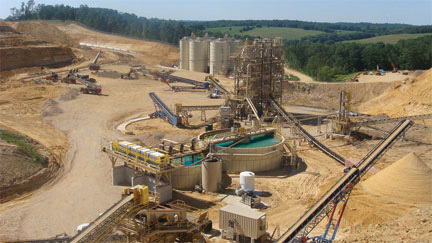 Please visit our Portfolio page for an overview of one of our frac sand project success stories.